This article will discuss the process of preparing for a successful dashboard implementation. There is power in storytelling. As humans, we find purpose in moving people to do great things. We use stories to make sense of things whether it’s giving your friend advice or explaining a business concept to your coworker. Well-designed dashboards tell a meaningful story with data in the form of charts, graphs, and scorecards that exhibit trends, opportunities and challenges with key performance indicators (KPIs) for your organization. Many software implementations can be difficult, and only a few companies today achieve “perfect” software implementations on their first try. If you are reading this article because your company recently purchased a dashboard tool or if you are wanting to invest in one, don’t feel discouraged. I’m here to help. In this article, we will discuss preparing for your first dashboard implementation. This article will focus on dashboard tips and tricks that enable organizations to understand their company data better for stronger decision-making. All companies, no matter the size, benefit from Business Intelligence (BI). Of all BI tools, dashboards are often seen as a top priority especially to Chief Financial Officers (CFOs) and other executives. According to Software Advice, a comparison site for Business Intelligence tools, dashboards, scorecards, and performance management software are priority number one for today’s financial executives. Dashboards provide quickly accessible, easily digestible analytics. It is an overview of your key information at a glance. Data Visualizations are graphs, charts, and scorecards that showcase data trends, opportunities, and challenges with key performance indicators (KPIs) for departments, projects, and/or the entire corporation. Making wise decisions is crucial for every organization because it heavily weighs on the company’s performance and condition, but just because an organization uses a dashboard, doesn’t mean it will be successful. In this article, we will focus on why a simple dashboard layout is typically the best kind of dashboard layout. 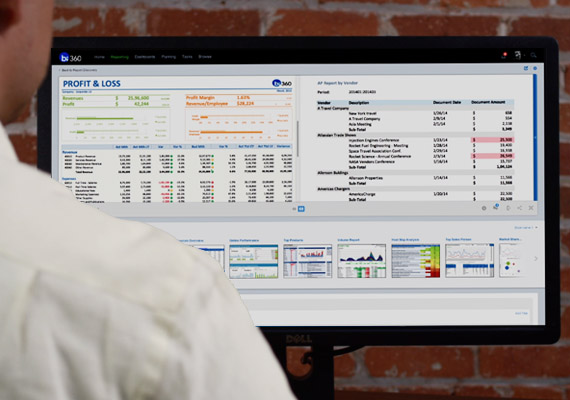 Independent software vendor (ISV) tools expand and streamline data management and analytics for Intacct users building best-of-breed Business Intelligence (BI) solutions. One question that sometimes comes up in conversations with Intacct customers is related to confusion as to why you might need to deploy ISV tool(s) on top of the accounting system. This is a small hurdle for ISVs as the confusion seems to quickly dissipate for the Intacct community. First of all, no software solution, even as great as Intacct has proven to be, can answer to every single business-related analytical hurdle for every company. A perfect example would be Apple offering their own native Maps applications on their iPhones, but still allowing consumers to install the Google Maps app, just as any modern flexible enterprise resource planning (ERP) system, like Intacct, does. Because every organization who utilizes Intacct has particular objectives, specific planning needs and rules, the accounting system will differ in how sufficient of a solution it is for each corporation. ISVs provide businesses the capability to customize their data management and analytics.